This calculator will calculate how long it will take to become financially free once you manage to pay off all of your debts and can invest your freed-up debt payments. Results include a year-by-year chart showing the growth of your financial freedom account and the corresponding monthly interest income. Select the month and year that all of your debts will be paid off. This date can be arrived at by using the Get Out of Debt Calculator or the Rapid Debt Reduction Calculator. Enter the total of all monthly debt payments, but without the dollar sign or any commas. This figure can be arrived at by using the Get Out of Debt Calculator or the Rapid Debt Reduction Calculator. Enter the total of all current savings and investment accounts, but without the dollar sign or any commas. Leave blank or enter a zero if you have no current savings or investments. Enter the annual percentage you would expect to earn on your savings and investments. Enter as a percentage but without the percent sign (for .065 or 6.5%, enter 6.5). Enter the monthly income you would need in order to become financially free. Enter as a dollar amount but without the dollar sign or any commas. Be sure to include amounts for inflation and income taxes. Also keep in mind that you will be debt free, so none of your monthly interest earnings will need to go toward making debt payments. Based on your entries, this is how many months it will take you to become financially free after becoming debt free. Based on your entries, this is how many years it will take you to become financially free after becoming debt free. Based on your entries, this is the approximate age you will be when you become financially free. Based on your entries, this will be the month and year when you become financially free. 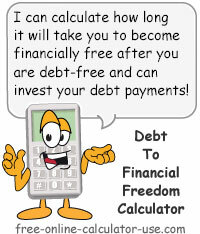 This calculator will calculate how long it will take to become financially free after becoming debt-free. The idea behind this calculator is that once you manage to pay off all of your debts, including your mortgage, you will then be able to start investing the total of your freed-up debt payments, plus any additional funds you were applying to your debt repayment plan. This is where you turn the tables on corporations who've been getting rich off of your interest payments. Instead of you being their investment vehicle, they now become your investment vehicles! Get Out of Debt Calculator (60 booster rocket options). In both cases, be sure to include your mortgage in your repayment plan to get the maximum effect. Select the month and year you expect to be debt-free by. Enter the total of your current monthly debt payments. Enter the amount of your current savings and investments. Enter the interest rate you expect to earn on your investments. Enter the monthly investment income you will need to become financially free. Tap the "Calculate Financial Freedom" button and scroll down to view the results.